Hello there! Amy Kolling here sharing some inspiration using some of the newest embellishments available in the Queen & Co. store! My first card uses the new Sparkle Ric Rac. I created my own floral embellishment by using my hot glue gun to attach the pink Sparkle Ric Rac into a circular pattern onto a scrap piece of white felt. I sewed on one button to the center. I thought this would be an adorable embellishement for a baby card. I added my die cut sentiment and banner along with the Ric Rac flower to a die cut edged panel of pattern paper from Heart Throb. My second card is CAS using some of the new Starburst embellishments. 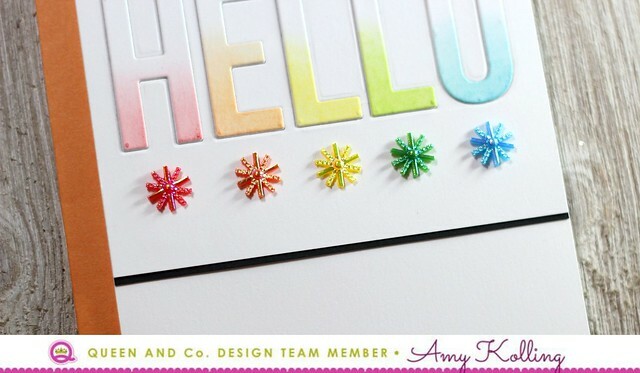 I created a rainbow 'HELLO' using Distress Ink and simply added the coordinating Starbursts below the letters. This panel was flanked with black cardstock to just offset the colorful rainbow.